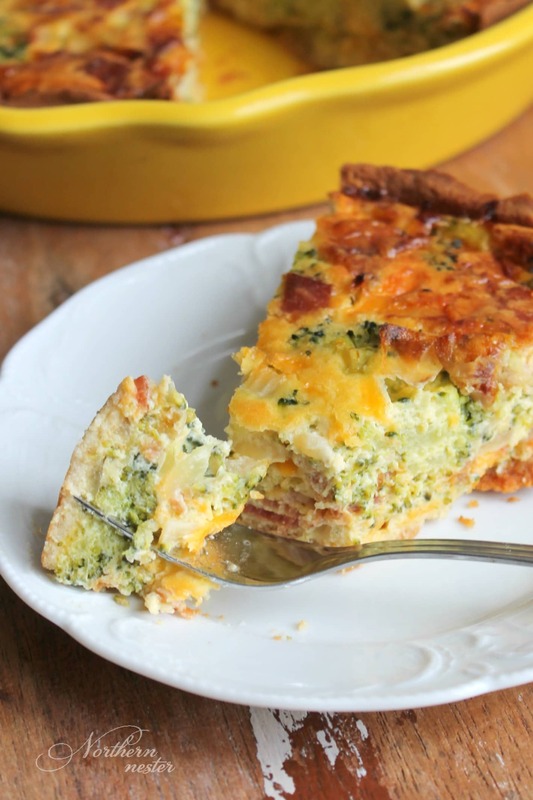 Growing up, one of my favorite supper was quiche. I loved it so much, I usually requested it for my birthday meal! It seems I passed down my quiche-loving gene to our oldest son, because it’s his favorite meal, too! 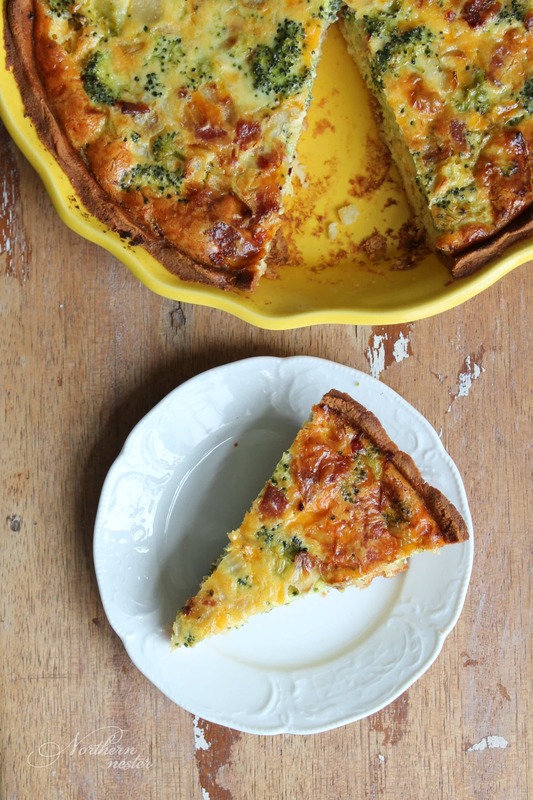 I finally took the time to turn my favorite quiche recipe into a Trim Healthy Mama-friendly version. 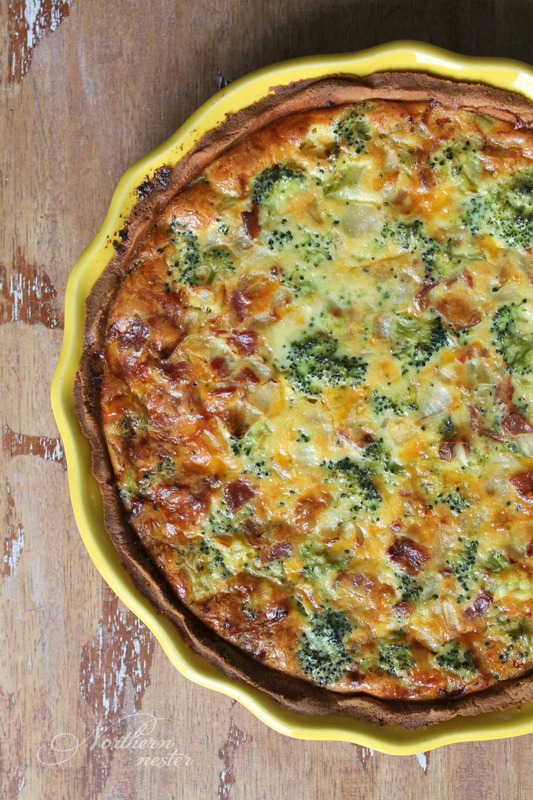 This Broccoli Cheddar Bacon Quiche is a gluten-free, low-carb, keto compatible, high-protein THM S! The recipe I grew up with used a Tenderflake crust and called for all-purpose flour and milk in the filling. We usually made it with mushrooms too, but I’m the only one who likes them in our family, so I left them out of this version. You could always add them to this recipe by frying them up with the onions. To create a flakier, savory crust, I took my well-loved almond flour crust and substituted Parmesan cheese for part of the almond flour. I also added an egg as a binder and to make it more flaky. Pre-baking the crust is important to keeping it from getting soggy. If you’d like, you can even skip making the crust to speed up the process and enjoy a crust-less quiche (a frittata!) by baking the filling by itself in a well-oiled pie plate. You may need to decrease your baking time slightly without the crust. Either way, this one’s sure to be a hit with the family! 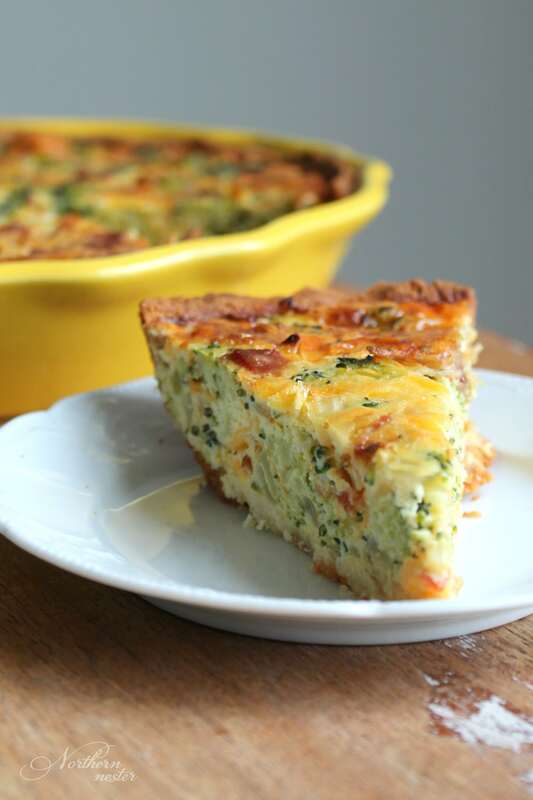 This delicious low-carb Broccoli Cheddar Bacon Quiche is fantastic for breakfast, lunch, or supper! Gluten-free, keto, and Trim Healthy Mama S friendly. To make the pie crust, pre-heat oven to 350 F. In a small saucepan, melt butter. Remove from heat. Stir in almond flour, Parmesan cheese, and egg. Press into 9-10" pie pate. Bake for 10-12 minutes, or until lightly golden. Remove from heat, set aside, and increase oven temperature to 375 F.
To make the filling, saute onion in butter until onion is translucent (you can steam the broccoli florets during this time too, if you haven't already done so). In a mixing bowl, whisk eggs and cream together. Stir in onions, steamed broccoli, bacon crumbles, grated cheddar, salt and pepper. Pour filling into pie crust. Bake at 375 for 40 minutes, or until a toothpick comes out clean. If this is for dinner, what else do you serve with it? I usually serve it by itself, but it’s also nice paired with soup (like my Mom’s Tomato Spice soup!). this was delicious thanks for the recipe ! Jacinda – This quiche is wonderful! I used gruyere instead of cheddar because I had it and love the flavor. Mine looks just like yours and tastes sooo good. The crust is perfect! Wonderful for Easter breakfast with a little fruit. Thank you for another great recipe. What are the macros on this recipe I didn’t see them? Thank you for this recipe. I made it last night and it was delicious. My husband and daughter loved it. I think next time I’ll make two and freeze one. So very good though. Thank you!